I always love sharing new picture books with you! Here are four that we’ve brought home over the last couple of months, and I think you’ll love them! 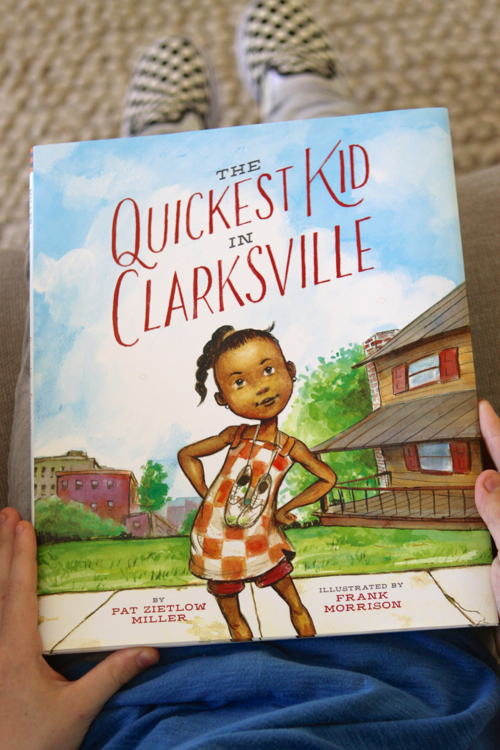 First up, The Quickest Kid in Clarksville, by Pat Zietlow Miller, with illustrations by Frank Morrison. 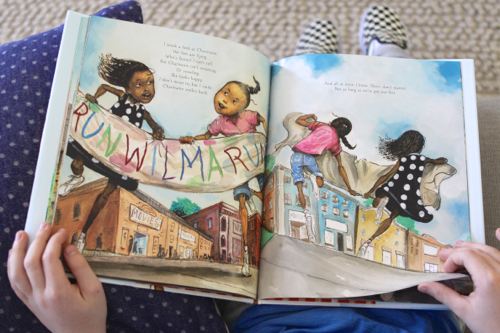 This is partly a book about kids learning to make friends, and partly a history lesson about Wilma Rudolph, three-time Olympic gold medalist sprinter. 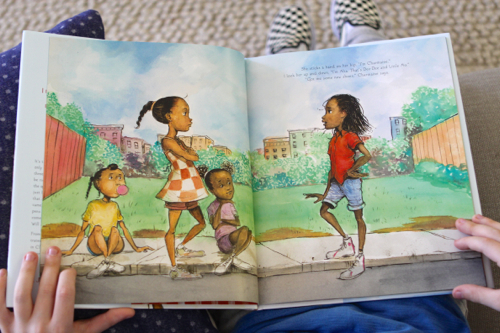 The story focuses on Alta, who is the fastest kid in town (even with holes in her shoes), and what happens to her when a new girl comes along who wants to challenge Alta for the “Quickest Kid” title. 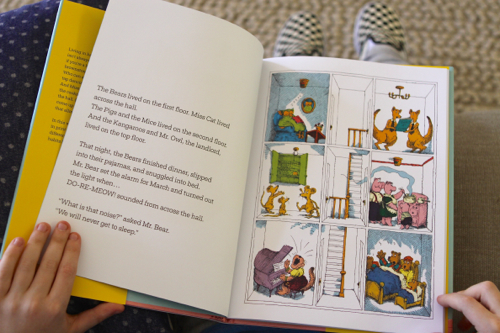 You’ll love it for the story — especially if your kids have a competitive streak. And the illustrations are outstanding, so you might love it for the images even more! 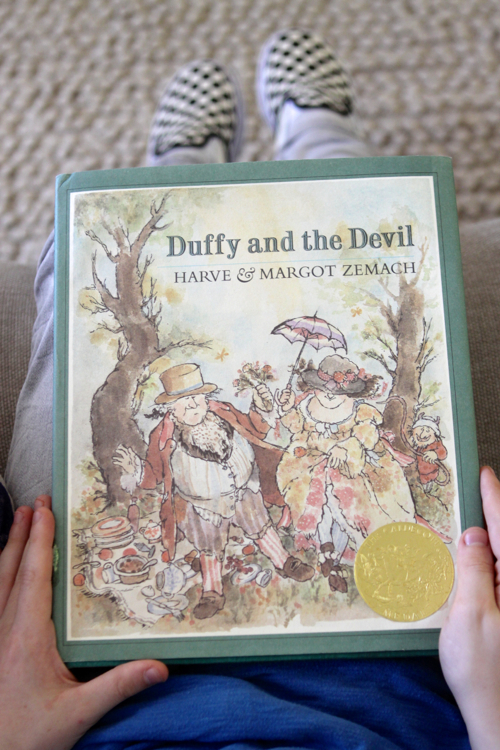 Next, Duffy & the Devil, by Harve & Margot Zemach. This is an older book — first published in 1973. And it’s a Caldecott winner. Ralph knows I collect Caldecotts and he searched out a title I didn’t have yet, found it at a used bookstore, and gave it to me for Christmas. It’s a good one! I read on Amazon that Duffy and the Devil was a popular play in Cornwall in the nineteenth century, and was performed during the holidays by groups of young people who went from house to house. 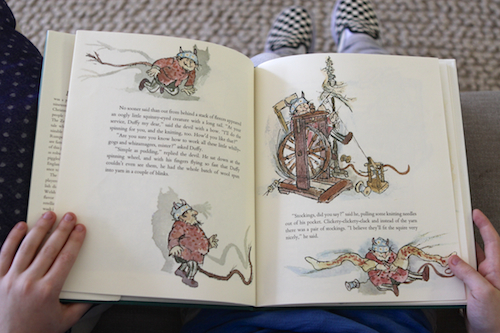 I had never heard of it before, but when I read the book, I realized it’s another version of Rumpelstiltskin. 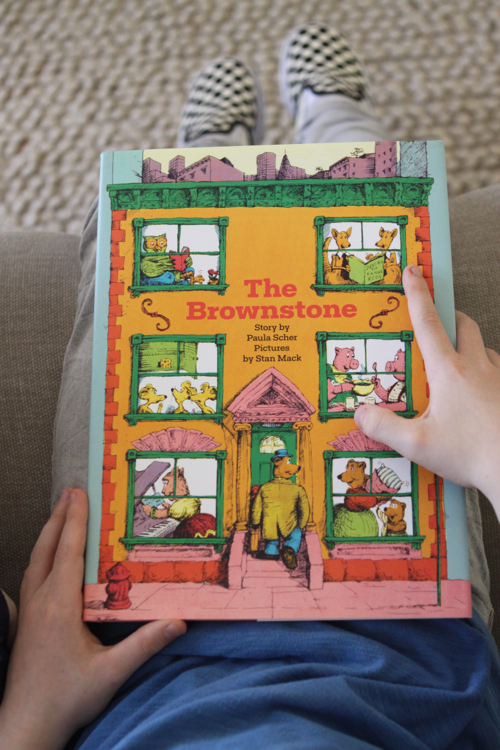 Then we have The Brownstone, with a story by Paula Scher, and drawing by Stan Mack. Paula Scher is one of the most famous graphic designers in the world, and I’ve followed her career since I studied design back in college. So I was very curious to see that she had written (not designed) a children’s book. Happily, it’s quite charming! It tells the story of a brownstone building, split into six apartments, each one with very different tenants. And each of those tenants have very different needs. Is it possible for them to all live together in a happy way? I really love this story because at it’s core, it’s about problem-solving and compromise. I’m a big fan of the idea that there’s always a way to make things work! 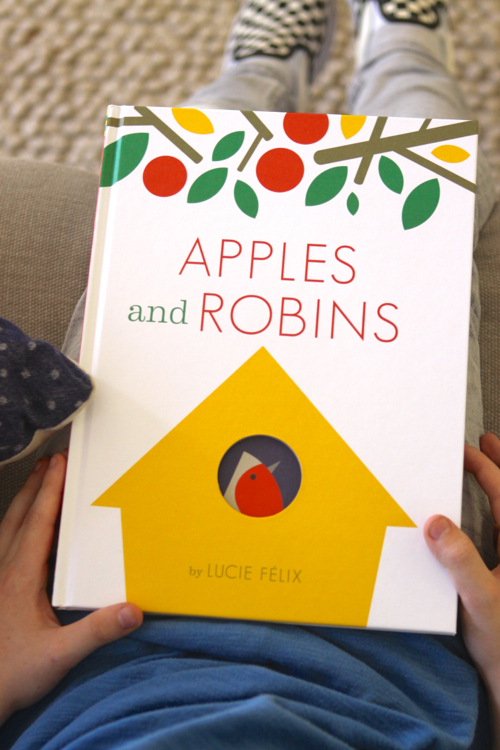 Lastly, I want to tell you about Apples & Robins, by French author, Lucie Félix. This one looks deceptively simple, but as you read it, it feels like a visual marvel. 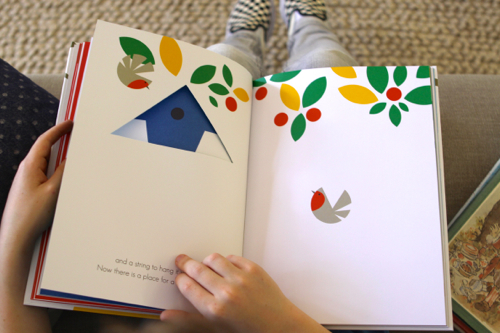 With the help of cutouts, shapes transform into birds and houses and ladders and lightning. What will you discover on the next page? Also, if you’re craving spring, this is a book that will make it feel a little bit closer. I’m thinking it would be cute as an Easter gift. Now it’s your turn! 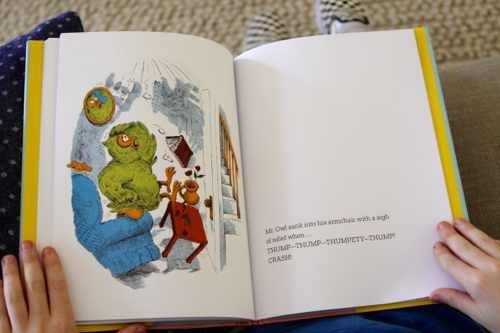 Any great picture books you’ve seen or read lately? P.S. — You can find all of the Design Mom book recommendations here. I could see the brownstone becoming my son’s next biggest obsession! We’ll have to get our hands on a copy asap! 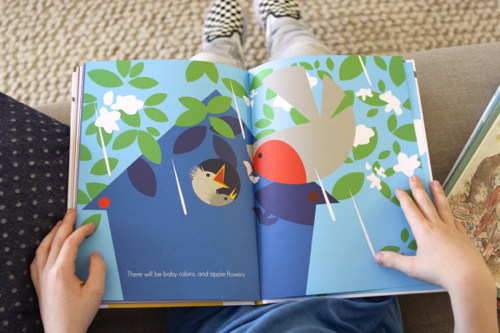 Thanks for sharing, Apples and Robins looks lovely! We’ve been reading old classics lately, like The Little House by Virginia Lee Burton, The Oxcart Man and Richard Scarry books. But some of our favorites are newer, like Rosie Revere, Engineer and Journey. Curiously enough, Little Golden Books is republishing a bunch of classics, plus introducing a whole new Star Wars-themed series. I’ve just ordered a whole slew of books to share with nieces and nephews over the next few months! >– “The Little Man of Disneyland” is going in the mail as a St. Patrick’s Day surprise (along with gold-foil covered chocolate coins, of course!). >– “Grandpa Bunny” and “The Fuzzy Duckling” are lined up for Easter presents. >– And the annual cousins’ Summer Book Club will be filled with awesome titles like “I am a Droid”, “I am a Jedi”, “Richard Scarry’s Just for Fun”, “Mary Poppins”, “Puss In Boots”…. The classic illustrations are wonderful — I’m so delighted they’re bringing them back. I’m totally excited to share them with some of my favorite young readers (all fifteen of them)! These are really great picture books for children . We also have one or the other German children’s book , what we like to read to our children. I am so happily surprised that Paula Scher wrote that book! Thanks for finding it! I have followed her work since college too! 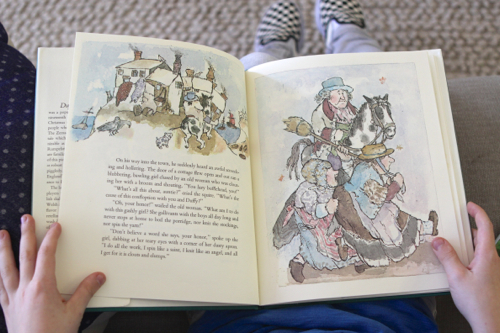 A lot of Caldecott books will always have my heart. I’ve also loved Gyo Fujikawa for the past couple years. And for Christmas, I found a new favorite for my youngest daughter–This is Sadie, by Sara O’Leary. Very sweet and simple illustrations about a little girl who loves imaginary play. Thanks for the recommendations; this is my favorite topic. Thank you for recommending “The Brownstone.” Our library had apparently just recently purchased it when we checked it out and it is wonderful! It teaches problem solving skills in such a fun and simple format.